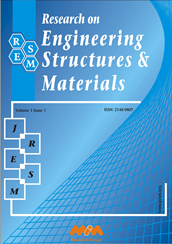 In this study elastic stresses and displacements of a rotating variable-thickness disk made of a radially functionally graded (FG) material are calculated numerically in an accurate manner based on the Complementary Functions Method (CFM). The general parabolic function which determines the variation of the thickness of the disk includes concave, convex and linear disk profiles. It is assumed that the inner surface is to be all-metal and the outer surface is to be all-ceramic. Young’s modulus and density vary between inner and outer surface by obeying the volume-fraction material grading rule. The disk is fixed to a shaft at the inner surface and free expansion exists at the outer surface. For the Ti-6Al-4V - Si3N4 metal-ceramic pair, the effect of the inhomogeneity constants on the stress and displacement is investigated. Results are presented in both tabular and graphical forms. Those presented in tables may form benchmark data for purely numerical calculations.